This weekend we played our first game with the Invaders; a prequel to the large scale 'Invaders Attack Cherbourg' exhibition match which we'll be playing next month. This game revolves around a scenario, Exodus, which you can download as a one page PDF (via dropbox). 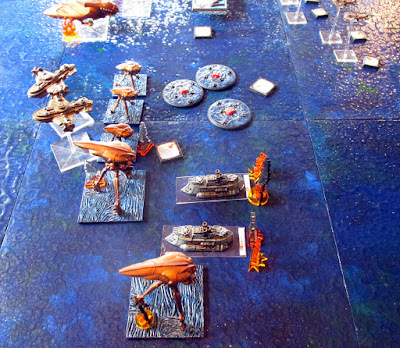 The scenario was intended to allow us to familiarise ourselves with the Invaders rules, while also allowing the human forces to fight a desperate and heroic action against a remorseless alien menace. The British fleet included a Monarch heavy battleship, Regent assault carrier a pair of Vanguard submarines and a squadron of Swift corvettes and Merlin interceptors. The British advance force consisted of a squadron of Hawk Scout Rotors and the ever reliable Agincourt gunships. The Russian force was anchored by a Khatanga heavy battleship, Moskva Dreadnought and Kostromo fleet carrier. 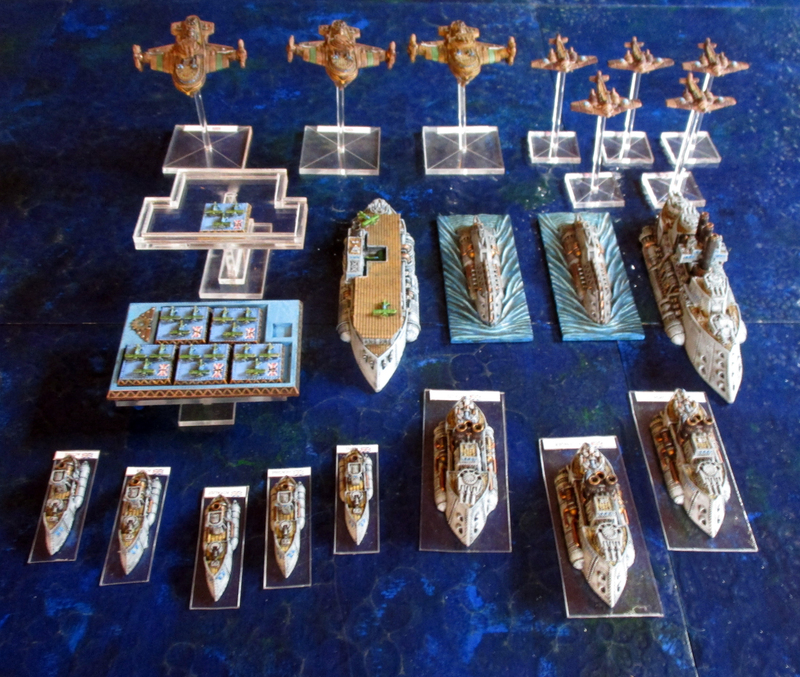 These were supported by a squadron of Chaney submarines and Suyetka interceptors. 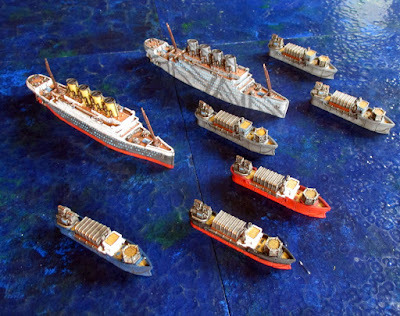 The Russian advance force included a squadron of Tiksi support cruisers and Novgorod frigates. 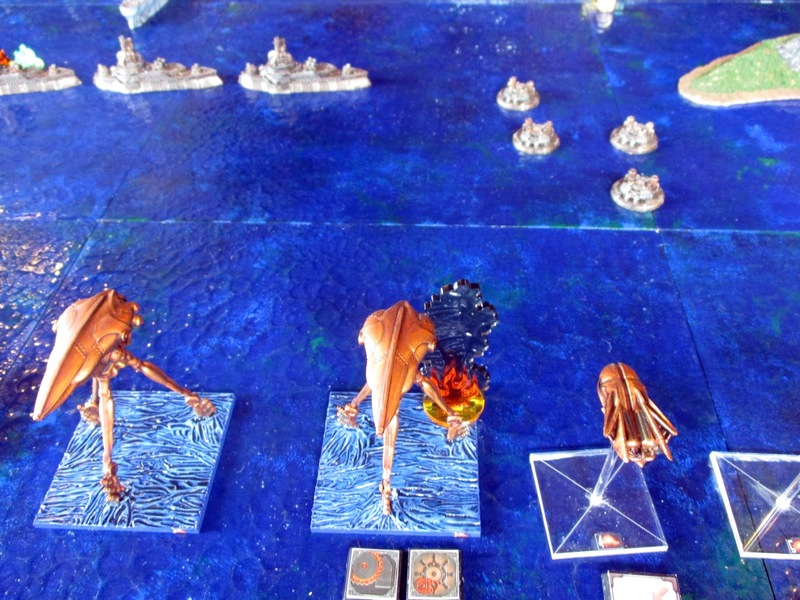 The Invaders took a twin command, each of which featured a Scarab hive ship (with 9 drones), a pair of Sentinel medium tripods, three Terror small tripods and three Predator bombers. We packed the decks of the ship; people from all walks of life, all desperate to escape the terrible and merciless advance of the Invaders. Now that we had cast off and left the hellish glow on the horizon behind us, we finally felt that we might be safe. It was said that the French had convened an urgent conference, and that nations of the world were sending their forces to fight the Invaders. Then we saw them. Towering tripods following us in silent, deadly pursuit. Panic erupted amidst our makeshift flotilla. 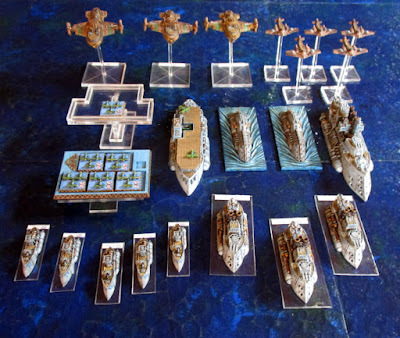 Just when it seemed all hope was lost, we saw them – a formidable armada of warships bristling with guns; British and Russian, all steaming toward the enemy at full speed. As the Interceptors swept overhead a cheer went up from all aboard. Signals flashed between the ships, and the refugee flotilla broke into two groups hoping that at least one group might escape the Invaders. 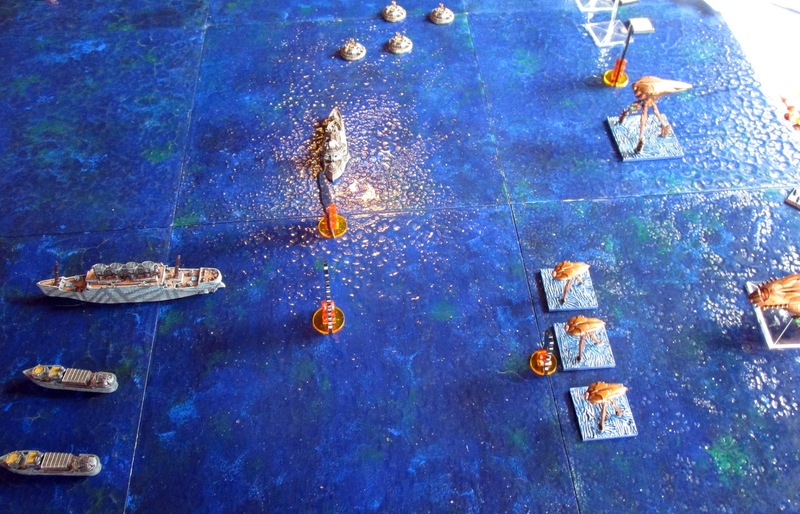 On one flank Russian Tiksi support cruisers sailed between the refugee ships forming a wall of steel as their mortars fired on the advancing tripods. On the other flank a squadron of Hawk scout rotors dropped mines, while Agincourt cruisers moved the block the pursuing invaders firing salvos of torpedoes. As the Invaders approached for the kill, the Russians sprung their trap. A squadron of Novgorod frigates launched form their hiding place, behind a small windswept, isle, and charged toward the largest tripods, firing with remarkable accuracy and coordination. 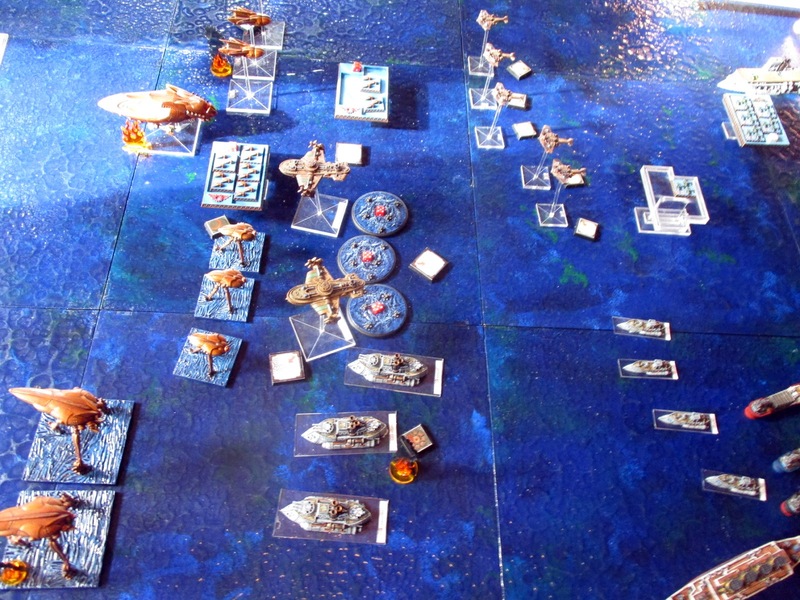 Meanwhile the Tiksi cruisers joined the fray, firing their mortars into a single gold giant at close range. The aggressive tactics of the Russians proved successful, as one of the huge Invaders war-machines stumbled, then silently slipped beneath the waves. 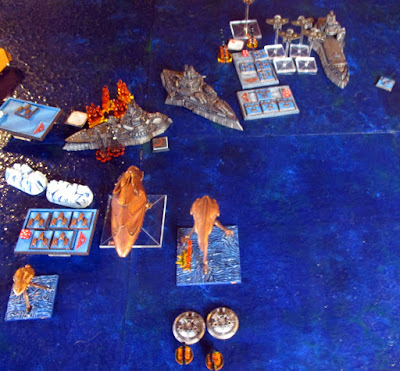 The Invader response was swift as one after another the Tiksi cruisers were torn apart by their terrible energy weapons until all three had burnt to the waterline. The Novogorod frigates also suffered as the Invader predator bombers unleashed their payload on the plucky little ships, destroying several. The brave Russian sacrifice allowed the refugee ships to speed away from the Invaders, heading to where three mighty Russian ships of the line advanced toward the Invaders. On the other flank the British rotors and cruisers duelled with the Invaders. The British shields saved them from catastrophic losses, and despite the overwhelming firepower, only one Hawk was sent plunging into the sea. 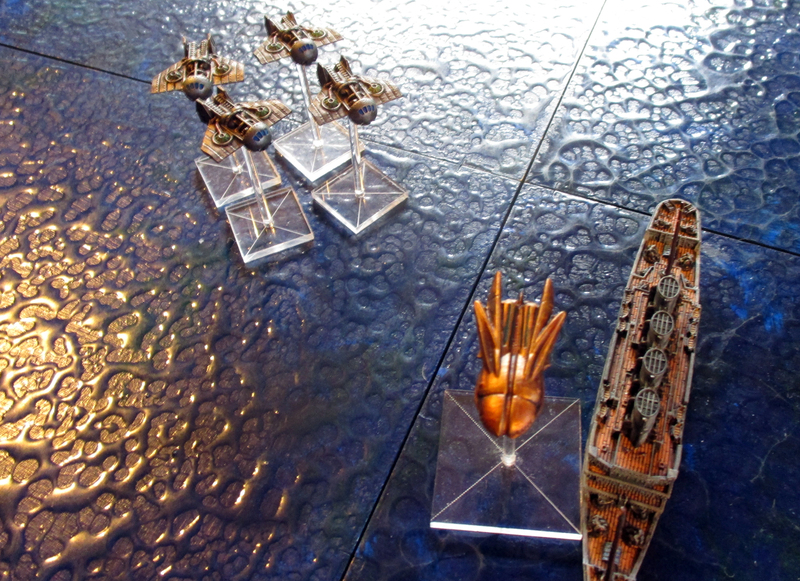 Now the Russian battleship, carrier and dreadnought enter the fray. 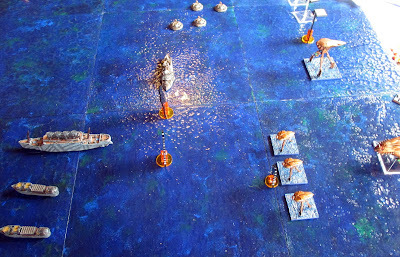 Their mortars and guns send the second large trip staggering drunkenly, and the surviving Novogorod frigates finish the job at point blank range. Return fire from the Invaders sweeps over the mighty Khatanga Heavy battleship leaving it ablaze from bow to stern. The Invaders also dispatch the Chaney submarines with contemptuous ease and repair their damaged tripods. Meanwhile, on the other flank the battle intensifies as the brave British ships close with, and pass the Invader line, giving almost as good as they get. 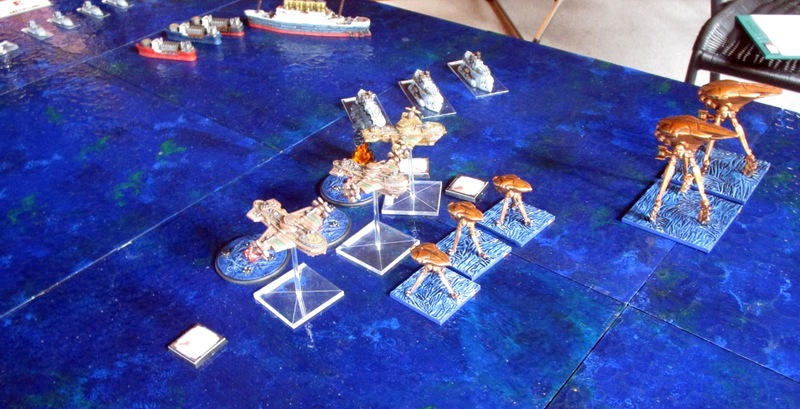 The Invaders manage to sink one of the Agincourt gunships, but both the towering sentinel tripods are now vulnerable to boarding parties as their strange alien armour is ruptured. Merlin interceptors sweep in and strafe the Predator bombers and the strange metallic wasps that surround them, downing a number of insectoid drones. 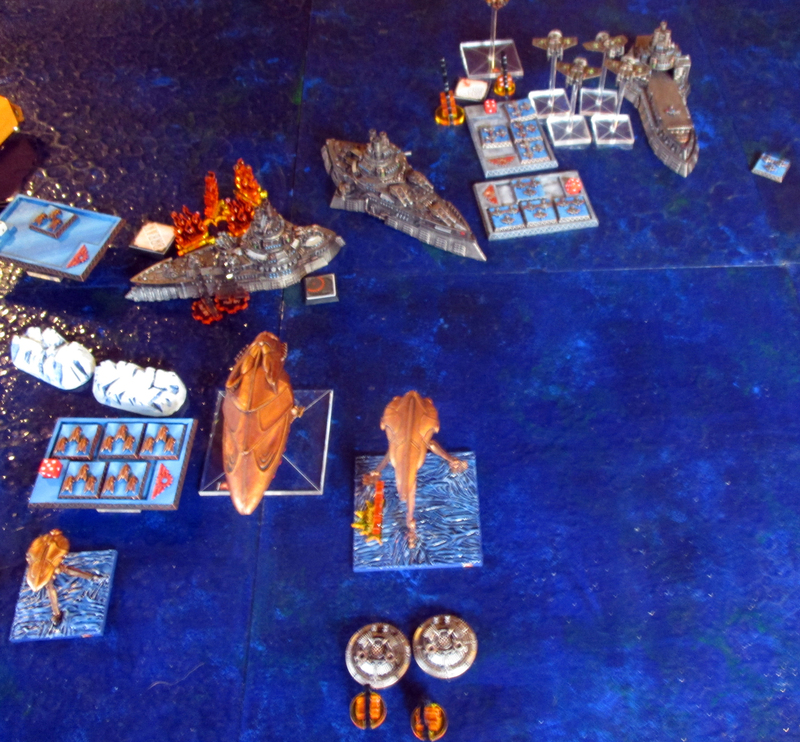 As the Monarch Heavy Battleship moves forward, firing at the enemy, it is hit amidships. Moments later it winks out of existence, then reappears suddenly much closer to the Invader line. 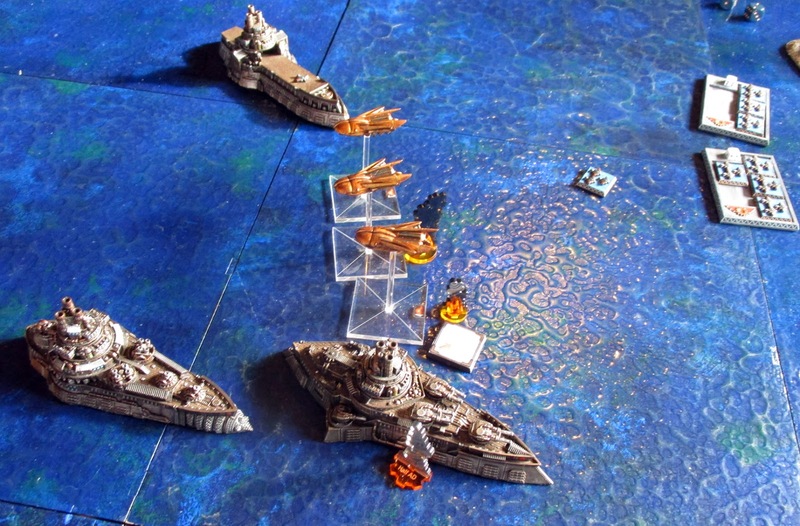 In a strange coincidence, well placed British gunnery causes the Invader Hive Ship to experience a similar distortion and it suddenly appears next to the Regent Battle Carrier, and much closer to where the fleeing refugee ships are trying to escape the carnage! The second squadron of Predators has been harassed by Russian fighters, and sustained significant damage but manages to make a bombing run on the Russian Heavy Battleship inflicting terrible damage. In response the Russians interceptors scramble and down two of the already damaged alien craft. 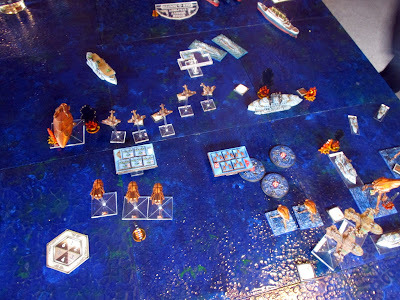 The human fleets have now delayed the Invaders long enough for the Hermes merchantmen to escape. The Titan transports are not far behind, and have remained largely unscathed although a solitary predator bomber tries to sink one of the mighty liners before it is shot down by pursuing Russian interceptors. The Scarab Hive Ship destroys the mighty Khatanga battleship and its death ray sweeps across the huge Moskva Class Dreadnought inflicting massive damage. The Dreadnought, in response, opens up at close range with a deadly barrage that destroys the badly damaged sentinel tripod and a terror small tripod. As more energy weapons strike the huge Russian ship it begins to list, but its turrets still fire defiantly. On the other flank the Invader firepower is just as fearsome, and the British suffer heavy losses as both the Monarch Heavy Battleship and the Regent Battle Carrier are consumed in a hail of plasma and fire. The stubborn Hawk Rotors and their accompanying cruisers keep up the fight, and boarding parties soon capture both sentinels, while magnetic mines claim the final terror small tripod. The Titan transports finally escape the battle, on a course for Cherbourg; their human cargo saved for the time being. The Invaders have been stopped and most of their mighty tripods and bombers destroyed, but the cost has been high, and the humans have few ships remaining. Victory Points at the end of turn three: Invaders = 1,485 (target 1,700), Humans = 1,470 (target 1,400). A narrow victory to the Human forces, their hard fought rearguard action allowing the refugee ships to escape and netting them a critical 500 victory points.